After years of playing guitar by self study i know all the chords but i still strugle to find my way freely on the guitar especially with inversions and other unique chords. Is this a matter of practicing the variations,or studying all the notes on the fret board so i can easily remeber and constract it myself? With something relatively complex like a chord shape, I think knowing the notes and where they are will work for some, but just knowing the shape and where it lives for certain chords is easier to establish. A lot of chords are sort of related to each other - add an extra finger, or take off one from a known shape, and hey presto, a different chord. But some are just alien in that they are peculiar shapes of their own. In those cases, get the shape, and hammer it on many, many times, in different places on the fretboard, until muscle memory takes it in. You will have to find the individual places for each finger, and be aware of the muted strings in some cases. When you're happy that it's nearly there, try putting other shapes either side so that a chord sequence is formed. This needs to be done with many different other known shapes. It's probably like what happened every time you learned a simpler chord - which would by definition get used more frequently - earlier in your career. Knowing your notes on the guitar, and the notes in a new chord, will help a lot particularly if you want to find other inversions and voicings. It's an interesting exercise to take some new chord - let's say G9b5, and know the notes in it are G B Db F A, and trying to methodically make all (or most!) of those notes fit onto 3 or 4 consecutive frets on the guitar, using as many strings as you have to. It's actually an exercise I use with students to explain why chord shapes are as they are, and the pleasant surprise seen when a basic chord is made in this way is palpable. The best thing you can do to achieve your purpose is to learn intervals. Let's say you have your index finger on fret 5, string 6. From here you should know exactly where to find a 3rd or a minor 3rd, a 5th and so on. When you'll read a chord like Asus2 you know you have to play 1, 2 and 5. It really doesn't matter too much that those notes happen to be A, B and E when we talk about chord fingerings, you will think about intervals to reach your result fast because they stay the same in any key. You read A maj7 you think 1, 3, 5, 7 and you put your fingers on those intervals. You need to know 5 basic shapes, C, A, G, E, D. Pretty much any imaginable chord is playable modifying those shapes to fit your intervals. Not the answer you're looking for? 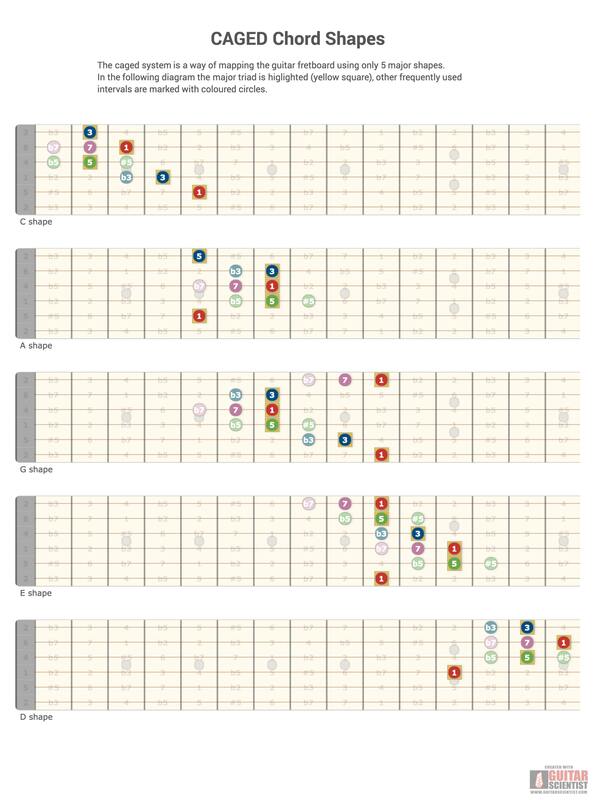 Browse other questions tagged guitar chords fretboard or ask your own question.